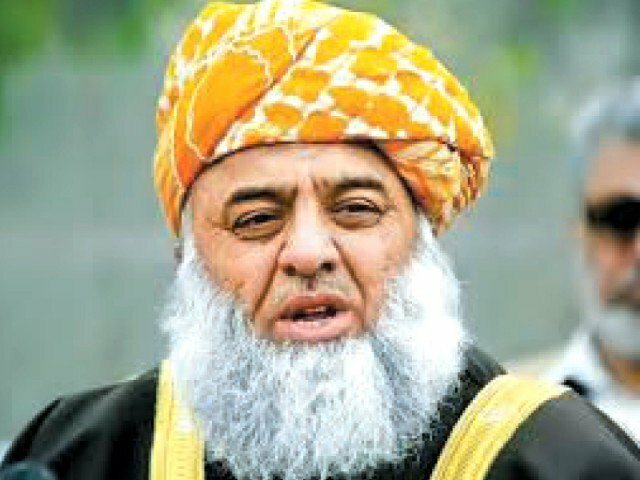 ISLAMABAD: Jamiat-Ulema-e-Islam-Fazl (JUI-F) chief Maulana Fazl ur Rehman Wednesday called for holding referendum in the Federally Administrative Tribal Areas (FATA) for its merger with Khyber Pakhtunkhwa. No legislation could be carried out under Article 247 of the Constitution regarding changing status of the tribal areas, he said speaking on a point of order in the National Assembly. The JUI-F leader said that referring bill regarding FATA reforms to the Committee of Law and Justice was not only illegal, but also against the parliamentary norms. The reforms bill was first referred to the NA body on States and Frontier Regions but was later transferred to the Law and Justice Committee. He alleged that the government did not fulfill the promises it had made with his party. They were assured that a bill to extend jurisdiction of superior courts to FATA would be passed while no other matter would be taken up. Now, other matters were being brought to the House, he added. Maluana Fazl said the merger of FATA with KP would affect the country’s internal and external situation. He appreciated the government efforts to change economic priorities of the country in the budget. He, however, alleged that efforts were being made to pass some legislation at the end of government’s tenure, which was contrary to the Constitution and Pakistan’s ideology. He alleged that currently, there was foreign pressure over the national economy, defence, politics and parliament. He said war against terrorism was being fought for the last 15 years in the country.”His party has reservations over its operational procedure, but agreed in the larger national interest,” he added. Responding to the points raised by Maulana Fazl, Qaumi Watan Party chief Aftab Ahmed Khan Sherpao said FATA’s merger in KP would help initiate a new era of development in the area. He said a committee set up by the august house visited all agencies and tribal areas, and presented its report in October 2016. He said the committee proposed three possible options, including a separate province, merger or status quo in FATA. Threadbare discussion was also carried out in this House about FATA in which all political parties participated, he added. He said the prime minister had also promised that the government would complete the reforms process and credit of which would go to it. His party had no pressure regarding FATA’s merger. A few people wanted to maintain status quo, while majority was in favour of FATA’s merger with KP, he added. He said there was a proper mechanism to amend the Constitution, expressing the hope that FATA would become part of KP and it would have representation in the provincial assembly. Bilal ur Rehman, MNA from FATA, said instead of FATA’s merger, the government should first fulfill its promises regarding its development, and rehabilitation of internally displaced people. Azra Fazal of Pakistan Peoples Party said the government should fulfill its commitments about FATA. The development process in FATA should continue after its merger with KP, he added. Ali Muhammad Khan of Pakistan Tehreek-i-Insaf said all the political parties, including Pakistan Muslim League-N, were in favour of FATA’s merger and urged Maulana Fazl Mehmood Khan Achakzai not to oppose the move. Sahibzada Tariqullah of Jamaat-i-Islami said the process for FATA’s merger was in the final stage and it would be completed very soon. Shaikh Salahuddin of Muttahida Qaumi Movement underlined the need for revoking the black law of FCR from FATA, besides providing education and health facilities to the tribal people. He said MQM was not against FATA’s merger, adding that referendum should be held to know public opinion in that regard.